The Genware Slim Cutlery range is a stylish and attractive range of catering & restaurant cutlery from leading catering supplies manufacturer Genware. Slim cutlery will will work very well in commercial catering environments and domestic kitchens alike. The uncomplicated design of the handle gives the Slim range a real sense of versatility – this range of catering cutlery really will work well with a wide variety of crockery and glassware styles. The Slim cutlery range also feels great in the hand, and as it\'s made by Genware, so you can be sure that it is a sturdy and reliable range of restaurant cutlery, well suited to even the busiest catering environments. Designed by Neil Jeffree (MA) who developed a restaurant cutlery range which used symmetry for a contemporary, modern elegant look with good balance. Slim is also manufactured from 18/0 stainless steel, and the Genware Slim cutlery collection provides high resistance to staining and pitting and maintains an elegant finish. 18/0 catering cutlery may offer more competitive pricing than 18/10 but it can still be considered a quality catering cutlery range. 18/0 catering cutlery benefits from working with magnetic cutlery catching systems, so Slim is a great choice for very busy catering establishments. Fit for purpose, Slim catering cutlery is strong and robust, combining style, performance and value all in one range of restaurant cutlery. This range of catering cutlery features all the key pieces required for any table setting. 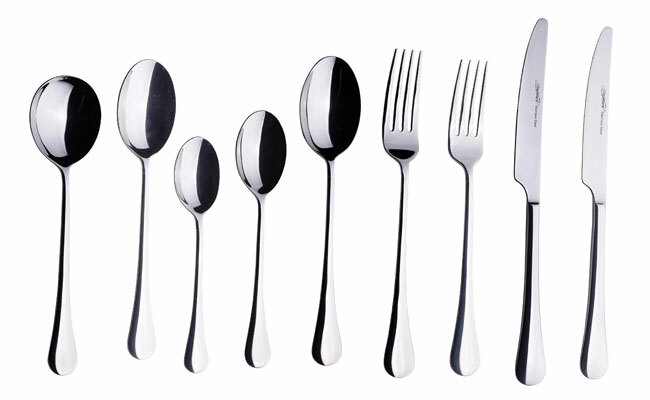 Slim cutlery’s range includes table knives, dinner forks, table spoons as well as dessert forks, spoons and knives. Slim by Genware is available to be delivered next day throughout the UK by Pattersons Catering Supplies. As a leading UK cutlery supplier we have been supplying businesses since 1889 with quality wholesale cutlery and supplies. Discover more from our huge range of 18/0 stainless steel and 18/10 collections online and find the perfect catering cutlery range for you, within budget. Stocking modern cutlery ranges, such as Genware Slim Cutlery, to fit for purpose budget cutlery ranges, every level of catering cutlery is covered by Pattersons Catering Supplies. We have carefully selected range of wholesale cutlery for the finest tabletops in our fine dining cutlery range through to more traditional table settings, see our restaurant Parish cutlery collection. With great service and lots of advice available, contact 0117 934 1270 if you have any questions regarding the Genware Slim range or a general wholesale catering cutlery question. Pattersons Catering Supplies stocks a wide range of catering cutlery to suit any pub, restaurant, hotel or bar’s table top.